Are you looking for a fun gift idea? I come from the kind of family where we write exact wish lists with specific items we want, and then just buy based on those lists, so I'm not always great at coming up with something when it isn't specified. I mean, give me a wedding or baby registry and I am that person who only buys things from the registry. We got invited to a couple's "stock the bar" party for Jeff's brother a couple of weeks ago. The concept was, instead of a wedding shower, we could have a fun cocktail party instead. Guests were asked to either buy something bar related off of the couple's registry, or to bring wine or liquor to fill their bar. Of course I waited a little on the long side to actually buy a gift from their registry (because that's just the type of procrastinator I am) but there were still Moscow Mule glasses available. 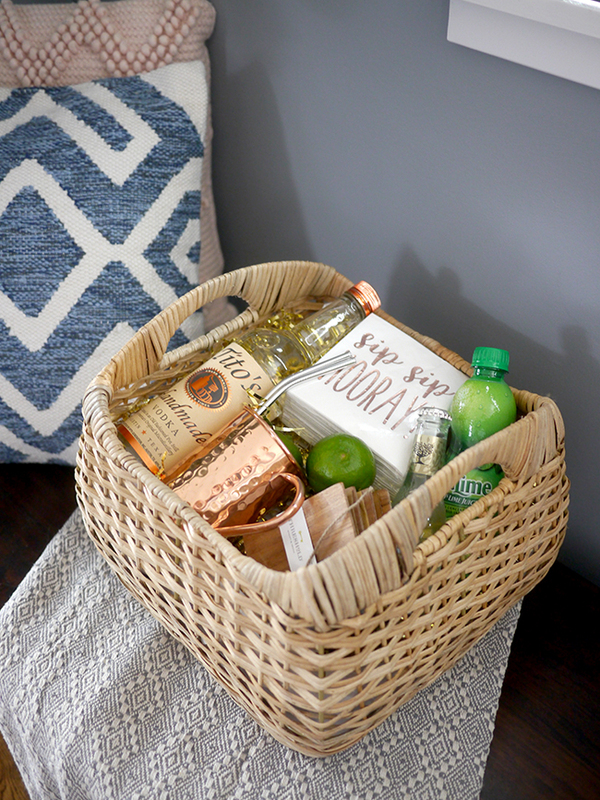 I had been planning on spending a little more on the gift, so I decided to make it into a gift basket! 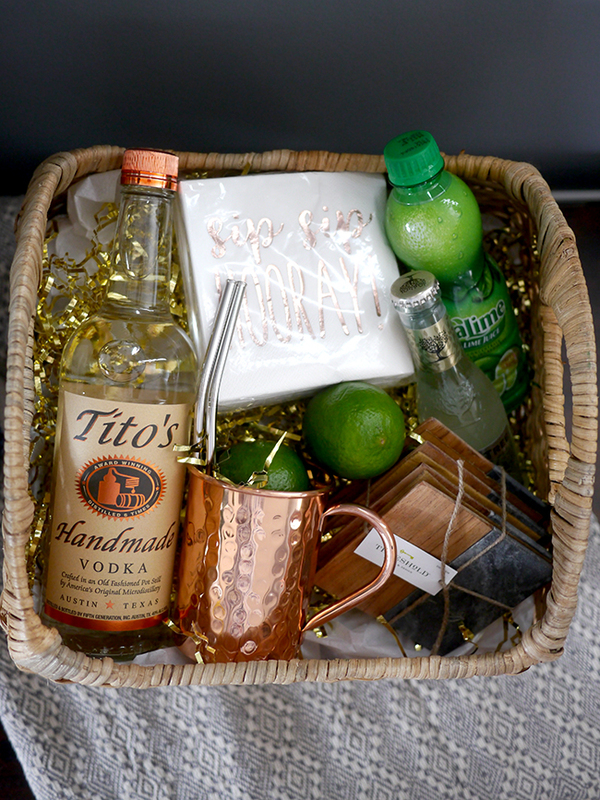 Our gift basket included the Moscow Mule glasses (of course), vodka, ginger beer, lime juice, and limes for the cocktails. I also tossed in fun cocktail napkins, some pretty coasters, and reuseable straws. 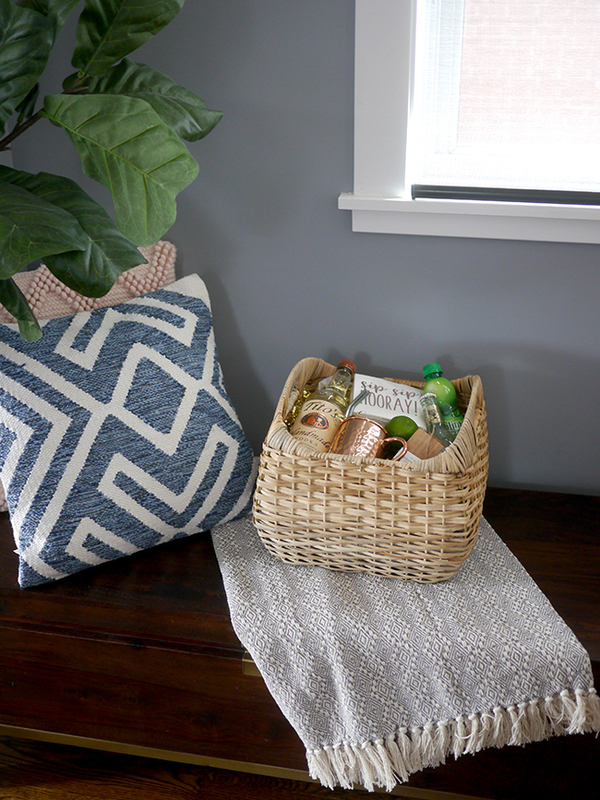 And then of course I picked out a pretty basket that was big enough to hold everything and would also look nice in their house. 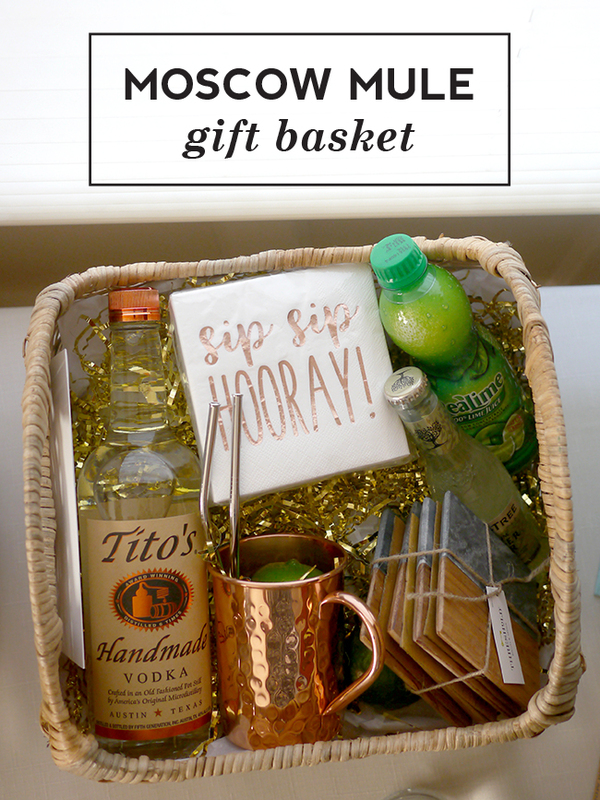 Someone else had already purchased bar tools off of their registry so I didn't want to toss in more random things, but you could also add in shot glasses, beer or wine openers, a pretty cocktail shaker, or other bar tools to fill out the basket. Some other ideas I had were a mint plant (some people will muddle mint into the drink or use it as a garnish), cute dish towels, a candle, or a gift card to a liquor store. 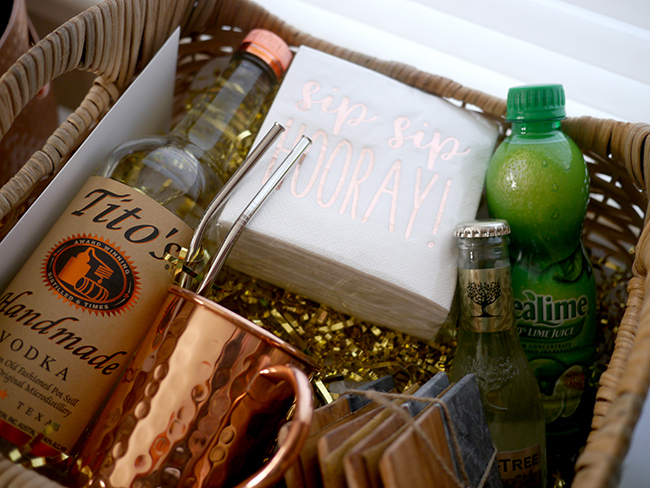 To put the basket together, I first added in the extra items that wouldn't fit in the top of the basket, so the rest of the Moscow Mule glasses, additional bottles of ginger beer, and the rest of the set of straws. Then I added a layer of tissue paper and some pretty metallic shredded paper. I arranged everything else on top, with some extra shredded paper in the glass so you could see the limes I put inside. Add a cute card and you're good to go! This would also be a fun gift idea for a 21 year old's birthday or for a bachelor or bachelorette party.